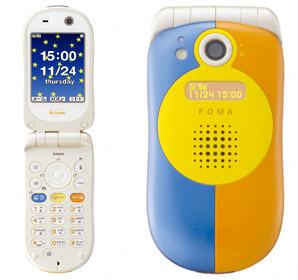 NTT DoCoMo have just announced a new ‘child-friendly’ 3G mobile phone, the FOMA SA800i made by Sanyo. The SA800i’s functions and compatible services are designed to help keep children safe, according to company PR. It is configured for easy use by children, and its rounded shape resembles a cocoon to emphasize the phone’s child-oriented security features. The handset has an alarm of about 100 decibels that children can quickly switch on in the case of an emergency and parents signed up for the new “imadoco search” location service can set their phones to automatically receive email announcing the child’s physical location, and the emails will continue at regular intervals. If the child activates the alarm, the handset will call up to three registered numbers with a voice message alert at regular intervals until all registered numbers pick up, or until a password is entered into the child’s handset. In addition, DoCoMo has established the Kids’ Advisory Board of people with expertise in children’s issues, who will advise the company on the development of products and services beneficial to children. The parents who are signed up for imadoco search can also set their phones to receive an automatic email of the child’s location when the child’s handset is turned off. Moreover, even after the child’s handset is switched off, it is possible to receive e-mails of the phone’s whereabouts in 15-, 30- or 60-minute intervals. The emails continue until a password is entered into either the parent’s or child’s handset. The battery can be secured with a special screw to prevent it from being removed and the phone deactivated. The screw must be removed with a special tool. Additional child-oriented features are available when the phone is set to “Kids’ mode.” Menu and instruction screens replace more difficult Chinese characters with simple Japanese alphabetic script (“hiragana” characters). The phone can be set to remain on until the child enters a password. Parents can use another password to prevent children from changing the handset’s security and network settings. The handset also has a direct call function. When the user presses the call button, contact information for up to five registered people pops up on the screen, making it easier to call or e-mail them. The SA800i is compatible with “Kids’ i-mode,” a service for FOMA i-mode? subscribers. The service will restrict access to unofficial i-mode sites to prevent children from viewing adult content. The “Kids’ i-menu” will list only content suitable for children. There is no monthly fee for the service, but packet communication charges will apply. See the Sanyo website [in Japanese] for more product specs. New Mobile Phones for Kids Rock! Train ‘em up early: kids’ phones rock!